Chances are, you're well aware that the new iOS 4, formerly "iPhone OS 4," was officially released Monday. And, if you're one of those with a compatible device, you've probably been eagerly anticipating the boost. While the vast majority of reported upgrades have been painless, there have been rumblings around the Web that not everything is working so smoothly. We even encountered some trouble here at the Switched offices when our iPhones refused to reactivate following the change, leading to an endless cycle of failed syncs that turned what should have been a 15-minute task into a two-hour ordeal. We can't guarantee you won't have any problems, but here are some tips to ensure that things go as seamlessly as possible. And, just in case the whole thing goes south, we've got you covered there, too. The first thing you should do before attempting to upgrade your device is to decide if you even want to do it. This is a particularly sticky issue for owners of the iPhone 3G, as there are numerous reports (which our own anecdotal evidence supports) of the now two-year-old 3G model suffering from serious performance and battery life issues when running iOS 4. If you're willing to make those sacrifices, you'll get added features like a unified Mail inbox and threaded e-mail messages, as well as a tweaked user interface and the folder function. You won't get access to some of the more advanced features, though, like multi-tasking or custom backgrounds. This goes for the second generation iPod touch as well. Third gen iPod touch and iPhone 3GS owners get all the features of iOS 4, aside from Facetime video chat, since that feature requires the forward-facing camera introduced on the iPhone 4 model, which comes out this week. Owners of the original iPhone and iPod touch are ineligible for the upgrade. Before you do anything else, update your computer's operating system (to ensure you won't have any interruptions) and your iTunes to the latest version (9.2), essential for getting the iOS 4 upgrade. Launching iTunes should automatically alert you to an iTunes update, but you can also use the Apple Update tool (on a Windows PC) or Mac OS X's Software Update. You can check what version of iTunes you're running by clicking on "Help" and then "About" in the menu. Once you've updated iTunes, you'll also want to update any apps you may have installed. It's easy enough: just click on Apps in your library, and then "check for updates" in the bottom right-hand corner of the window. Next, you'll want to back up your iPhone or iPod touch. This is perhaps the most important thing you can do before upgrading. iTunes makes it relatively simple: just plug in your device, right-click on it's icon in the left-hand menu, and select "back up." We wish there were an easy way to back up your iPhone without iTunes, but all non-iTunes solutions involve jailbreaking and complicated schemes to get around Apple's security measures. Lastly, you'll want to perform a final sync to copy all of your apps and content to your PC or Mac. Well, now, if you've so decided, it's time to take the plunge. Select your iPhone in iTunes and click "check for update." The update should download and install iOS 4. Obviously, don't interrupt your device while it's updating. Yes, this means don't unplug it, don't touch the power or home buttons, and don't close iTunes or anything else that could potentially spoil the upgrade process. 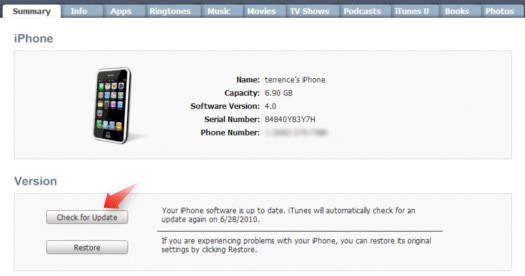 Once you've updated to iOS 4, you'll want to check that all your settings were restored properly. Then, it's time to get acquainted with all the new features and shortcuts: Lifehacker has a great guide to the new tricks your iPhone can now perform (like grouping apps into folders), and our friends at Engadget have a must-read round-up of the best apps that already take advantage of some of the new features (like background audio streaming). If everything goes terribly wrong and nothing seems to be working, you've got a few options for recovery. 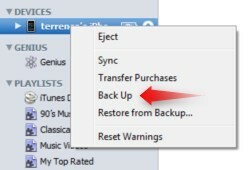 First, you can try to restore from a backup by right-clicking on your iPhone icon in iTunes, and selecting "Restore From Backup." You'll be asked to pick which backup to restore, so choose the one immediately preceding your update. This will not re-install iOS 4, but will remove and restore application data and settings. If that doesn't solve your problem, it's time to try a complete software restore. You do this by clicking "Restore" on the summary tab in iTunes. (You'll find it right under the "check for updates" option.) This will wipe your iPhone, reinstall the OS and then prompt you to either restore your backed-up data or start from scratch. Disconnect your iPhone from your computer. While pressing and holding the Home button, plug your iPhone back into the computer. Continue holding the Home button until you see the "Connect to iTunes" screen. The truly desperate can attempt to downgrade to iPhone OS 3.1.3, but -- be warned -- it involves downloading the software from a third-party source, and requires the use of an application other than iTunes. This should only be attempted as a last-ditch effort to revive a non-functioning device, and only if you're at least moderately tech savvy. Otherwise, you may have a trip to the Apple Store or AT&T in your future. Hopefully, when all is said and done, you'll have a nice shiny iDevice loaded with Apple's latest mobile OS. If you managed to brick your device, well, just use it as an excuse to rush out and get that iPhone 4 we know you've been lusting after anyway.